TWO buses have been secured to ferry rescued students and staff members from St Charles Luwanga School from Silverstream in Chimanimani to Chipinge this afternoon. A Roman Catholic Diocese of Mutare Bishop’s secretary Father Sherpard Munaro, who was with the students told The Manica Post that a third bus was on standby on the other side of the Chipinge-Tanganda route waiting to receive them and proceed to Mutare. The first batch of the students is expected in Mutare by 6pm. 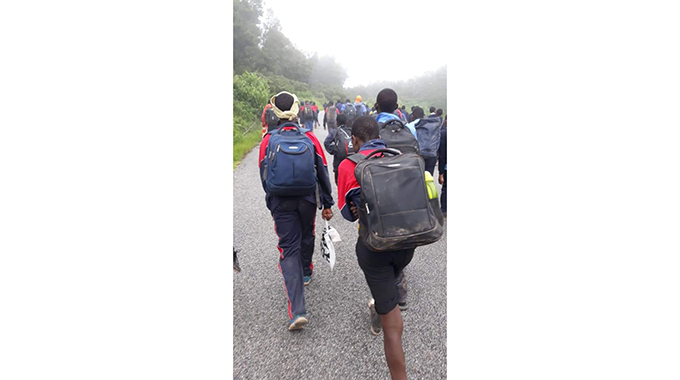 “I am at Silverstream with the students (171) and members of staffs (12) from St Charles Luwanga. They are all in good mood apart from the anxiety of wanting to go home and be with their loved ones after their ordeal. Two students were injured and are currently in hospital. A few students had lacerations and were bleeding, but generally all of them are in good spirits. “We have secured two buses from Gaza Primary School and Matione Primary School that are carrying the students to Chipinge where they are expected to shower and have a meal before proceeding to Mutare. The third bus is on stand-by on the other side of Chipinge-Tanganda Road to receive the children at that point where the road gave in and take them to Mutare,” he said.